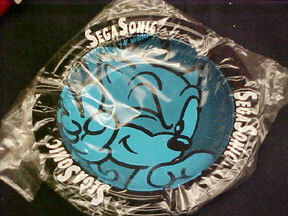 Containing some of the strangest and rarest samples of Sonic the Hedgehog merchandise photos for you to marvel at. (or go WTH to...) 99% possibility of NO WHERE else on the web with even a sampling of these unusual health care products. Simple enough, yet never marketed in boxes like normal ones. 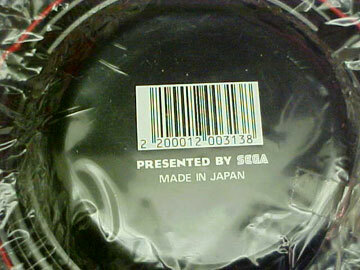 Who knows where these might of been aquired other than "Somewhere in Japan". The front side is just white. 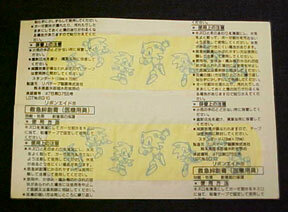 A Close up of the nicely done classic Sonics all over the unusually yellow bandaid. Tissues! Well, at least the pocket-pack variety. 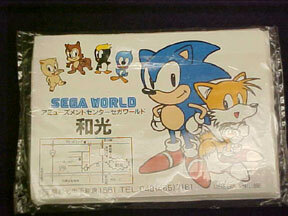 There's even a map of where you can go to get more...(Sega World) if you can read it. A Hand-Towel of some sort. It is not moist. 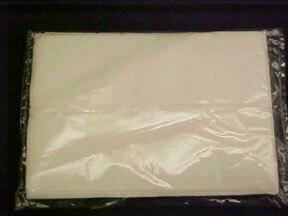 Feels like a single thin paper towel in a bag. 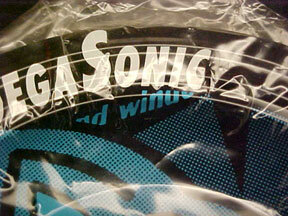 Totally covered in Classic Sonics, even the lesser-known designs. It is fairly large. Ok, now for the contraversy! Smoking is NOT hygene. Cigarrettes are such trash. So why then...are there ash-trays here? Excuse the expression, but "What were they smoking??" 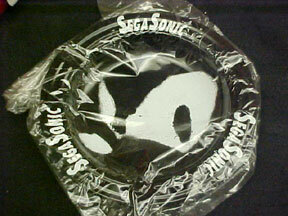 when someone decided to license Sonic AshTrays. (And these are the real deal! Just check the photos...It's not a fan item or hoax) These are just in the Hygene Section because they don't really fit anywhere else, and they are quite odd. The design on this one is really rather cool. It has a 'spatter spray-paint' like effect that was really different and edgy for the time. You can kind of see it in the photos, but the bag-glare gets in the way a little. You can really tell they're ash-trays in this one. The others and they might be strange, low, metal bowls or something. This one clearly shows cigarrette rests at the 4 points. 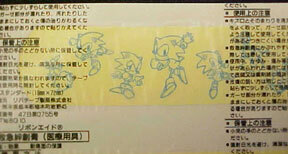 Look at the back! This thing is not a sticker, and it appears on all of them. It's done in the same paint as each design. These are old too, before everyone was bootlegging like a maniac off of Ebay. What is this wierd, toon-ey design? It was obviously a part of something else...(see detail) but I never did figure out what. 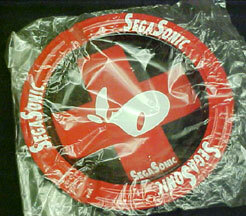 I also have a Sonic Wetnap (Hygenic moist towlette in a bag) but I seem to have misplaced it. When it turns up, it will appear here.